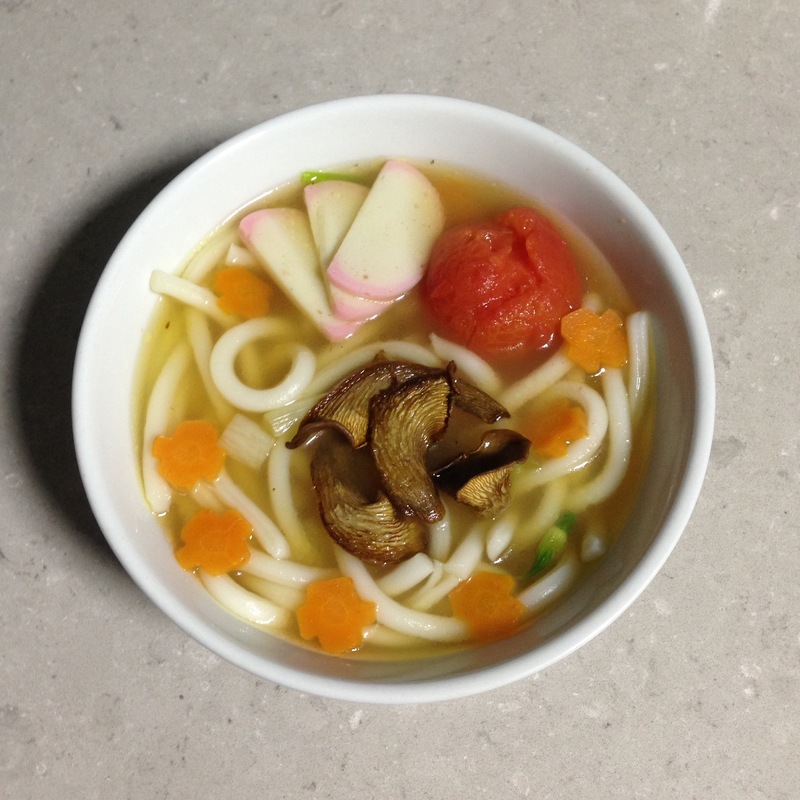 But today’s post is about udon. Yup? thick strings of slight chewy noodles which has become a favourite with our 4yo and she has been, still is asking for udon if she’s asked what she prefers for lunch/dinner. I think she can even have udon for breakfast if she could. Unfortunately most of the udon we can find here are really mediocre, not to mention not worth the average $12-$15 per bowl (or the calories for us adults). Quite terribly made stock too. Lucky for us, doting daddy is always ready to take in the challenge, and it’s not that hard ( I think) to make than to find a decent bowl of udon. Make a dashi stock: add kombu into a pot with 1 L of water. Slowly bring to boil. Remove the kombu and add the bonito flakes. Let simmer for 1 min. Turn off the heat. Sieve away the bonito flakes. Add a tablespoon of good quality soy sauce. Cover the lid. Preheat oven, turning on top heating element only, at high heat, abt 220degC. Tear up the mushrooms if necessary, toss in oil and salt. Grill in oven until caramelised at the edges. Boil a fresh pot of water. Add carrot and simmer. Cut a cross at the base of the tomatoes and blanch in the boiling water for 10s. Remove the tomatoes. Add udon and loosen with chopsticks. Cook for about 2 mins or till the udon is al dente. Pour over a colander and wash the udon with cool running water to stop the cooking and remove excess starch. Portion udon into serving bowls (2 big or 3 small potions). Pour hot stock over and arrange ingredients decoratively on top. Remember the mushrooms! Serve remaining spring onions on the side. This entry was posted in Cook and tagged Udon on September 21, 2016 by three3seconds.